All of them definitely need a little TLC, started with a good cleaning. A few of them are broken. Some of them have lost their mate and therefore need to find a new purpose. Some of them, okay ALL of them, need updates for sure. 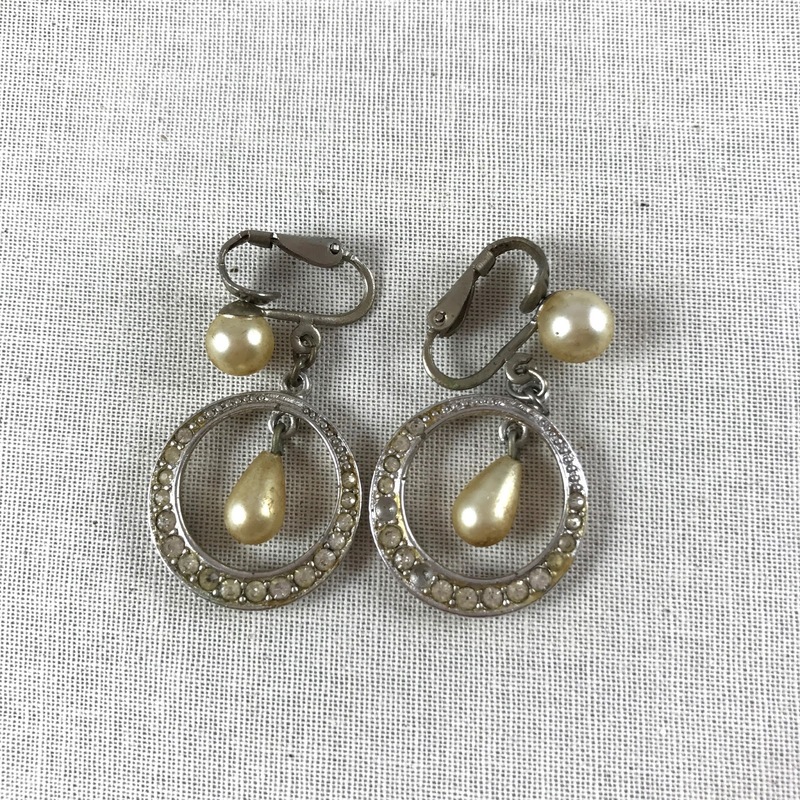 The rhinestone and faux pearl earrings are extremely grimy, but I see serious potential! 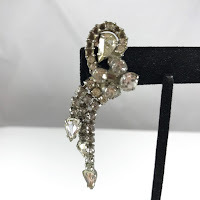 They will soon be morphing into a pair of pierced earrings, with small changes that will give them an updated look, while still keeping their vintage charm. That's the plan anyway! Lately, I've been thinking a lot about mismatched earring pairs. 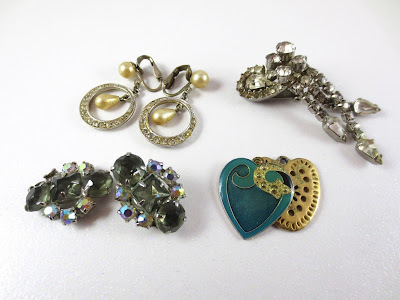 I've looked at lots of other jewelry designers creations for inspirations on this. With Valentine's Day about a month away, hearts seemed like a good idea right about now. I think these two hearts compliment each other well and will make a great pair of mismatched earrings. 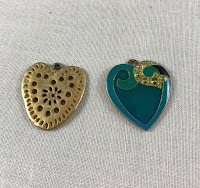 The gold heart was a charm, and the green heart was a small pin. I've already removed the back, and have added an attachment to that it can easily be made into an earring soon. Not exactly sure of my design yet, but I can't wait to figure it out. I'm really excited about these! This is one lone earring who lost it's mate. 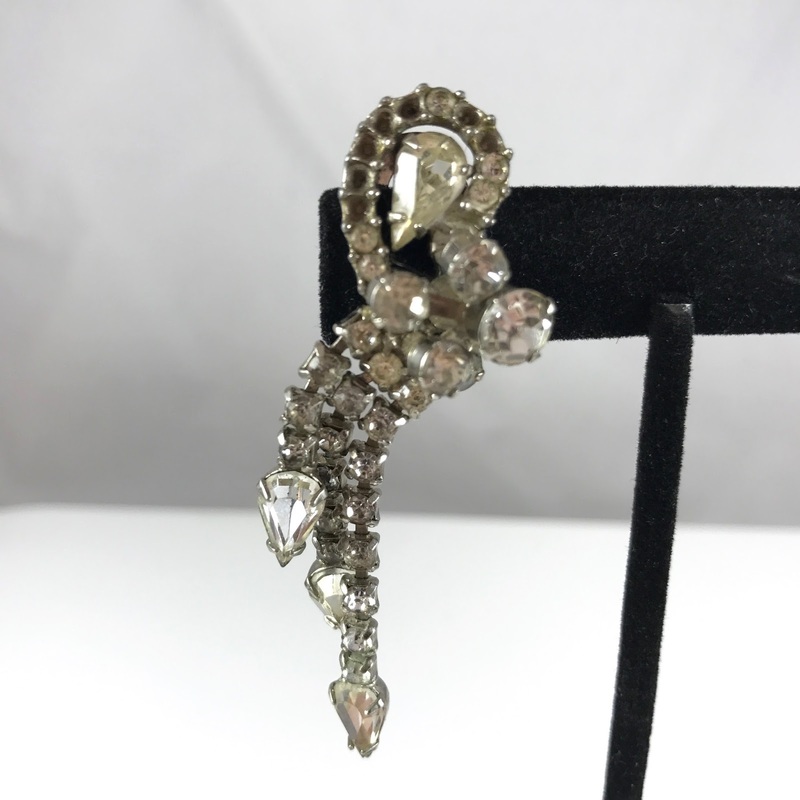 And is missing several of it's smaller rhinestones. It looks odd clipped on to an ear actually anyway. I like the idea of how this will hang as a focal point for a necklace. It's very cool and is full of possibilities to be a gorgeous, one of a kind necklace. It's probably been very bored for the last 50 years or whenever it lost it's partner. 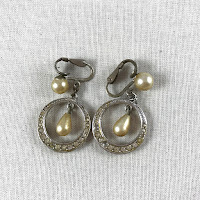 But to this lonely earring I say~ it's time to reinvent yourself and get back out there! 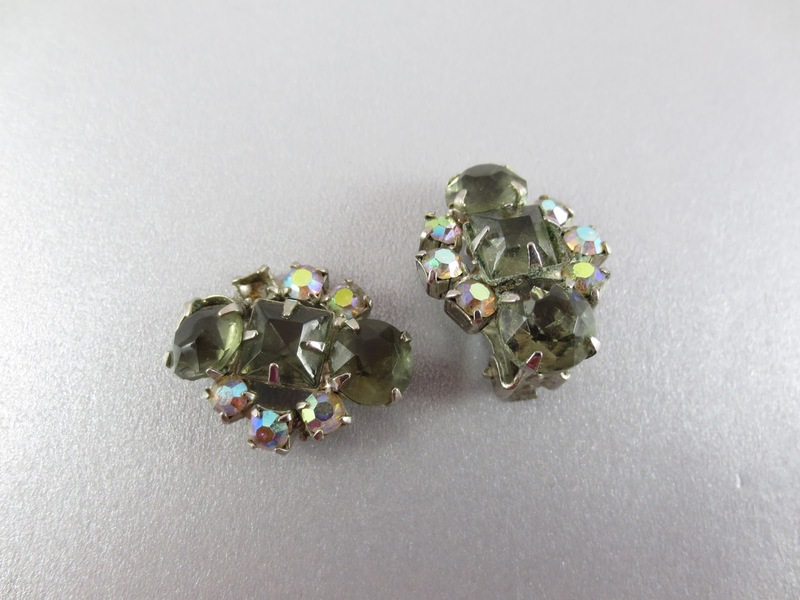 Lastly, these pretty 1950s rhinestone earrings... One has lost it's clip and is missing a small rhinestone. I think (and hope) I just might have a spare rhinestone the right size around here somewhere. And they're both very dirty. But neither of those things is a big deal or a reason to be shut up in someone's drawer any longer. I can't wait to do something with these two! So there it is. I've got my fun work cut out for me. Sometimes, I have so many projects I want to do that I get a little overwhelmed, and then nothing gets done. So I've narrowed it down just just these 4 things that I've posted here today. My plan is to post up all the "after" pictures on the blog next week! Yay for accountability! I love the heart so-to-be earrings! Great idea and those two do look perfect for each other. Can't wait to see what you do with all of these!